Bean Bag Bucketz: Bean bag tossing lawn game. The next time you throw a backyard BBQ, throw some tunes on your portable stereo and throw some bags into Bean Bag Bucketz. 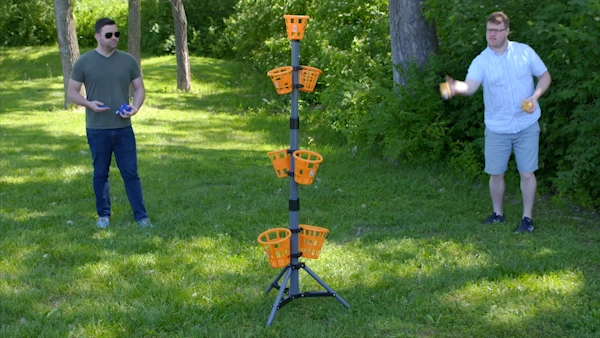 The throwing game pits two teams against one another as they take turns tossing the included miniature bean bags into one of seven buckets attached to the tripod game tower. 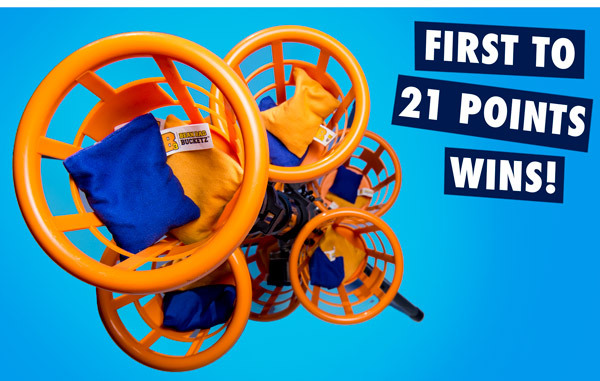 Buckets that take more skill to land are worth more points. 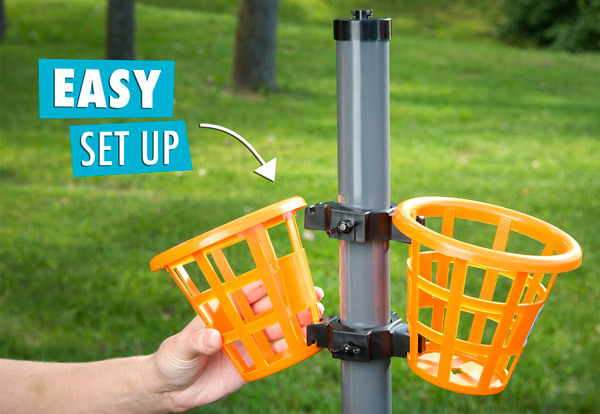 The simple game is simply buckets of fun to play! 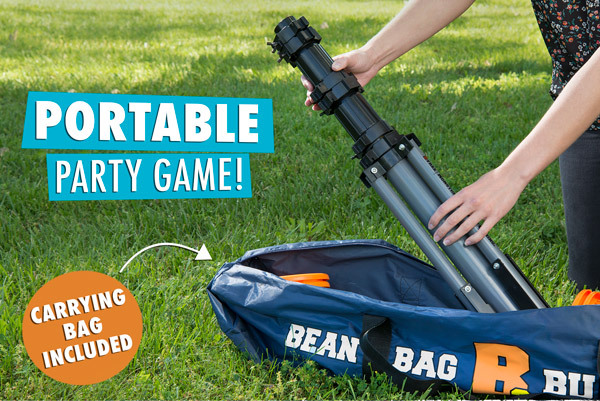 The game is also ultra-portable, so collapse it into the carrying bag, throw it into your trunk, and take it to the beach, park, or wherever you have your outdoor fun. 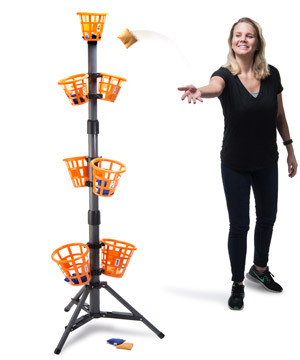 The gist of Bean Bag Bucketz is familiarly fun: try to throw a bag into one of the cups on the tower for points. 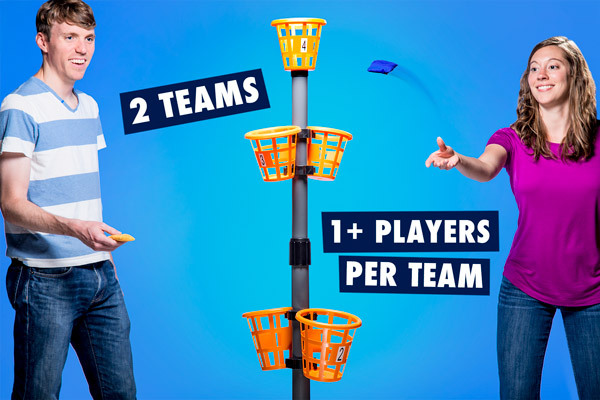 The game is simple enough for a casual toss at a backyard BBQ and challenging enough for a competitive match in a Bean Bag Bucketz tournament. To play Bean Bag Bucketz, each team will take turns tossing their eight bean bags at the various baskets on the tower. 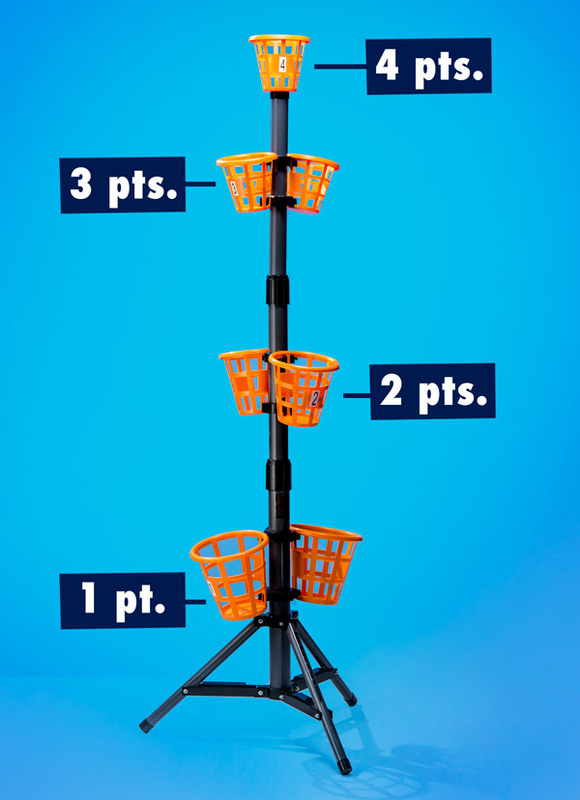 Smaller baskets are worth more points, so each pitch is a trade-off between big points and big baskets. 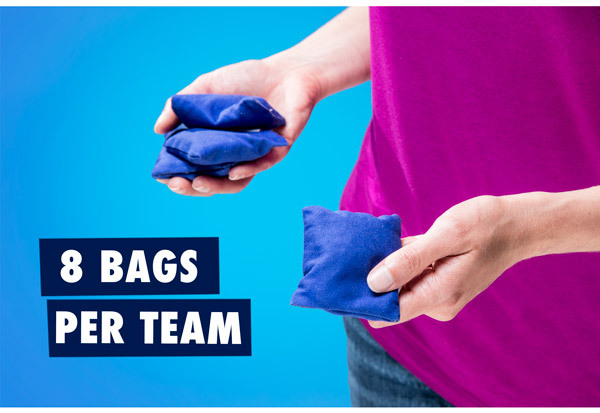 Once all sixteen bags have been thrown, teams count up their points. Only one team can put a score on the board, so cancel out the lower score and subtract that from the team with the upper hand to see who scored that round. The first team to 21 points wins. Sink your bags for the win. Bean Bag Bucketz is made to go wherever the party is happening. 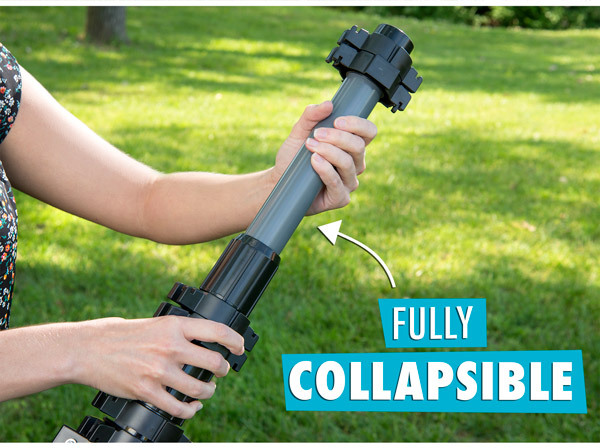 Easy to set up, the tower is fully collapsible and fits neatly into its included carrying bag along with the buckets and bags. 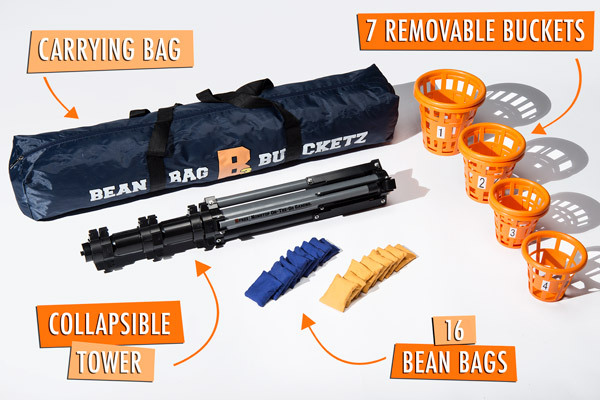 Bean Bag Bucketz comes with everything to get the game—and your party—going: a collapsible tower, seven removable buckets, two sets of eight bean bags, and a carrying bag that fits everything. Sling it over your shoulder and take it anywhere you want to bring the fun. Question: How many people can play? Answer: You can certainly practice solo, but B3 is designed to be played competitively with at least two players. Players can divide into teams and share the 8 bags per team to allow more people to play. Question: How far away should I stand to throw? Answer: The distance to the tower is set as a house rule, but typically, play is between 6 and 12 feet, depending on skill level.